Seems with the current orbital timing that folks in the Northern hemisphere are at a disadvantage due to the early morning passes being silent because the delay timer is not activating the transmitter until about 15 minutes after the satellite comes out of eclipse. For folks in the Southern hemisphere there are some excellent day and evening passes occurring for the next couple of weeks. Hope to see a few more images from Australia, South America, Africa and some of the equatorial regions during this time frame. I really like the Earth with Sun light glinting off the surface. The next image of the coastline is very nice as well. 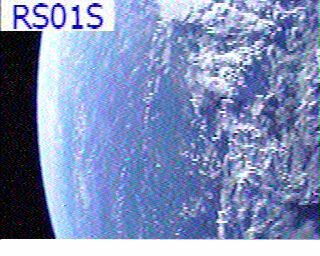 Congratulations to KD8CAO and SP8CGR respectively for capturing and submitting these spectacular images from ARISSat-1 over the past couple of days. 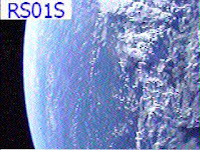 Starting to see submissions from some new stations and hope to see even more over the next few months that ARISSat-1 is predicted to be in orbit. 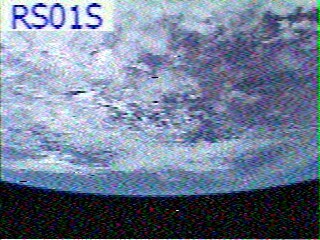 Did you also know that you can get a certificate for receiveing an SSTV image from ARISSat-1? 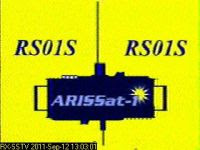 Go to the ARISSat website and look under the FAQ for "reception certificates" and follow the directions. Now that the satellite is rotating less the images are getting much cleaner. Here is a nearly perfect copy one of the default images sent when no other images are in the queue. 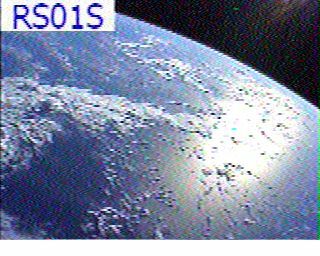 Congrats to JHøGEV and his station for being able to get such a clean SSTV copy from space. This image captured by KD8CAO has some really nice lighting on the clouds and seems to give it some added depth. Uploads of captured images still coming in and the gallery has received over 1,500 images since ARISSat-1 was deployed. Keep them coming! If this image were in black and white then I might have thought it was a shot of our moon. Thanks to JAøCAW for capturing this image on Sep 6. Since the number of wonderful images was getting a bit long, we started over for the month of September. The best images from August are still available by choosing "ARISSat-1_Aug_2011" under the display mission drop down menu on the main gallery page. You can always go to the archive to see everything but may need to select a higher page number for images that were published more than a few days ago. 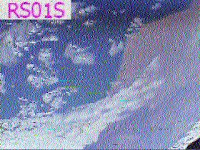 I expect September's page will be even bigger now that ARISSat-1 seems to have slowed its tumble rate and the fading is less of an impact to the images.